Time Trial World Champion Tony Martin will lead the strong roster of Katusha-Alpecin during the 43rd Volta ao Algarve which takes place from the 15th to 19th of February 2017. 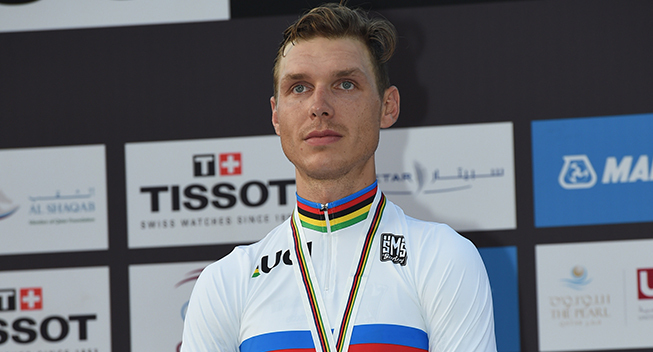 Four times individual Time Trial World Champion (2011, 2012, 2013 and 2016), three times TTT World Champion (2012, 2013 and 2016) and two times winner of the Volta ao Algarve (2011 and 2013), Tony Martin will be one of the contenders for the general classification on the first edition of the Volta ao Algarve as a 2.HC race. The team registered in Switzerland will attend the Volta ao Algarve with the two Portuguese riders of its roster, José Gonçalves and Tiago Machado. According to the official enrolment form sent by Katusha-Alpecin to the organization of the race, the team also count on Simon Spilak, winner of the 2015 Tour de Suisse, Baptiste Planckaert, number one of the Europe Tour Ranking, Maurits Lammertink, winner of the 2016 Tour of Luxembourg, Sven Erik Bystrøm, U23 Road World Champion in 2014, and Mads Würtz Schmidt,2015 U23 World TT Champion. After the globalization of Team Katusha-Alpecin, the Pro Continental Gazprom-RusVelo is now the most important Russian Cycling squad. For the Volta ao Algarve, the Russians have chosen a mix of young and experienced riders: Sergey Lagutin, stage winner in the 2016 Vuelta a España, Alexey Tsatevich, stage winner in the 2016 Volta Catalonia, Nikolay Trusov, former team worker at Tinkoff, Kirill Sveshnikov, Sergey Nikolaev, Evgeniy Shalunov, Ildar Arslanov and Artem Nych. The Rally Cycling will be the only foreign continental team in Algarve. The American team registered eight riders for the Portuguese race, Junior Time Trial World Champion Brandon McNulty, Robert Britton, Matteo Dal-Cin, Adam de Vos, Evan Huffman, Colin Joyce, Sepp Kuss and Danny Pate. WorldTour: Astana (CAZ), Bora-hansgrohe (GER), Cannondale-Drapac (EUA), Dimension Data (RSA), FDJ (FRA), Katusha-Alpecin (SUI), Lotto NL-Jumbo (NED), Lotto Soudal (BEL), Movistar (ESP), Quick-Step Floors (BEL) and Team Sky (GBR).